One of the midseason frontrunners for Minor League Player of the Year will join the Boston Red Sox today, as Mookie Betts is reportedly on his way to the Bronx and will have his contract purchased from Triple-A Pawtucket. The news was first reported by the Boston Herald's John Tomase. At present, there was no word on the corresponding move, but with the club carrying 13 pitchers, the team is expected to exchange an arm for Betts' bat with the offense in dire straits. No 40-man roster move will be necessary after the club's release of Grady Sizemore earlier this month opened a spot. The promotion caps a truly astonishing ascent for the 21-year-old Betts, who made his Low A debut with the Greenville Drive on opening day of 2013. Betts started slowly with Greenville, sporting a .145/.340/.263 line after May 2. In his next game, on May 5, Betts began a 19-game hit streak, and he has essentially not stopped hitting since. He hit .347/.434/.554 with 13 home runs and 34 stolen bases in 104 games across two levels to close out the year. Given an aggressive assignment to Double-A Portland to start this season as the tenth-youngest player in the Eastern League on opening day, Betts continued to do nothing but hit, forcing a promotion to Triple-A Pawtucket on June 2 and posting a .345/.437/.520 line with eight home runs and 29 steals in 77 minor league games so far this season. He also generated buzz after putting together a streak of 71 consecutive games reaching base, extending back to last season and including Salem's five playoff games en route to winning the Carolina League championship last year,that tied the modern-day record held by Kevin Youkilis and Kevin Millar. Betts has been regarded as one of the top hitters in the minors this season, along with the likes of Gregory Polanco of the Pirates, Joey Gallo of the Rangers, and Kris Bryant of the Cubs. 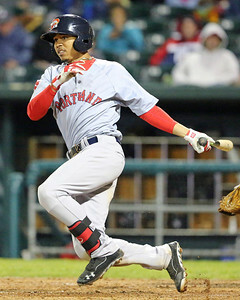 Upon the graduation of Xander Bogaerts on May 2, Betts was named SoxProspects.com's top prospect. He combines great athleticism, outstanding pitch recognition, an elite ability to square up pitches when he does swing, and great speed on the basepaths. Drafted in the fifth round of the 2011 draft as a shortstop out of John Overton High School in Brentwood, Tennessee, Betts played just one game that season, for the GCL Red Sox, before making his proper debut in 2012 with the Short-Season A Lowell Spinners. He began that year at shortstop, but moved to second base after less than a month, in part in deference to the arrival of Deven Marrero and in part due to some struggles at the position. Given the presence of Dustin Pedroia at the keystone for the foreseeable future in Boston, Betts made his outfield debut on May 18 of this season with Portland. He has since made 27 starts in center field, and he got his first taste of right field two nights ago for the PawSox. Photo credit: Mookie Betts by Kelly O'Connor.